Bud, flower, seed - each has its own beauty. 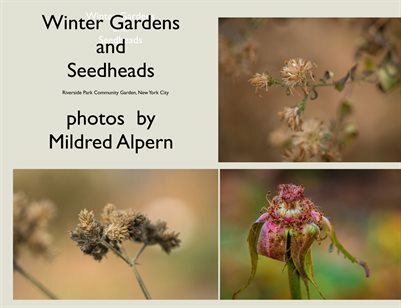 In winter, the Riverside Gardens of New York City reveal new forms, varied shapes and textures in muted shades of umber and burgundy. Seed structures have silky fibers and tails to float to new destinations. Other seeds simply drop in place. Flowers in their last hurrah billow dusky colored petals. Ornamental grasses glint golden. The dormant gardens have a sartorial splendor deserving notice.